Posted: Sat May 05, 2012 9:15 pm Post subject: Are you magicJack User? Can I ask who is your favorite magicJack agent? 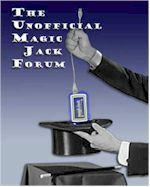 Posted: Sun May 20, 2012 12:22 am Post subject: Re: Are you magicJack User?